With the addition of Noghalt, Gravity has revisited all the existing classes and implimented one or two skills for each of them. These skills are usually available through a short quest, and available to all characters of that class, either normal characters or transcend characters. Like other quest skills, if you chose to transcend after recieving a quest skill, you can relearn it by talking to the job master in Valhalla. Cast Time: Depends on range. Description: Charge Attack causes you to rush the targeted monster, dealing more damage depending on how far away you are from it. Quest: Talk to "Esobe" in the Knight Guild building. Outside, therethere will be 5 training knight npc's nearby. Talk to each of them. You may need to talk to them each more than once. After talking to Esobe again, return to the knights and talk to them. The farthest left one should give you a hint. He will ask you to bring 5 candy canes and 3 witherless roses. Once you have the required items, return to the knight guild and talk to Epeso. He will teach you Charge Attack. Description: Reduces the Zeny cost of Mammonite by 10%. Quest: In Geffen, near the blacksmith guild, talk to the NPC 'Aki'. He will ask you to bring the following items: 1 Steel, 5 Coal, 5 Steel Hammer, 1 Detrimindexta. When you return to Aki with the ingredients he will again ask you for more items. The items are as follows: 1 Steel, 3 Coal, 1 Steel Hammer. With these items, Aki will teach you Dubious Salesmanship. Description: When used, you automatically pick up all items within 2 cells around you. This does not override the priority of who gets to pick up the drops, and it cannot be used in PVP, WoE, or in town. Quest: Just outside the Geffen Blacksmith guild, there should be a dwarf by the name of Goddi. In order for him to teach the skill to you, you must show him just how much you can carry. Come to Goddi when you are within 500 or less weight of your maximum weight limit, and he will teach the skill to you. Description: Throws a venom knife at long range to deal damage and poison the enemy. Venom Knife does damage based on your base attack, and does not count race/size/element cards or EDP. The chance to poison is based on your level of envenom. Venom Knives are an arrow type equipment and can be purchased from the Assassin Guild for 50z. If you do not have any Venom Knives equipped, the skill will fail. Quest: Simply talk to one of the npc's inside the assassin guild, and he will teach you Venom Knife. Description: Increases the hit and attack power of the skill Sonic Blow. Gives Sonic Blow +50 hit, and increases the damage by 10% for all skill levels. Quest: Outside the assassin guild, there will be two npc's, Kiltin and Ismil. Talk to them, and they will send you to either Sphinx 2F or Piramids 4F. In the sphinx, at 1 o'clock there will be a pipe with a gem, and at 9 o'clock there will be a statue with an ornament, and you'll need to steal both. If you are sent to the piramids, the pipe and statue will be along the wall (not certain on the exact location). On the pipe, there will be a poisonous snake guarding it, which can cause you poison, blindness, or curse status effects. Just keep clicking, and eventually you will recieve a Saphire. At the statue, its trapped and has a chance to put you to sleep with gas. Again keep trying until you recieve the Ruby. Return to Kiltin and Ismil with the gems to recieve the Sonic Acceleration skill. Cast Time: 4 seconds unreducable by dex. Casting is uninteruptable. Description: Sacrifices yourself in order to revive all party members near you. The skill will affect any party member within a 15 * 15 area around you, and they will all be revived with 50% hp. When successful, this skill reduces your hp and sp to 1, and you lose 1% of your exp. For each person you revive with the skill however, the penalty is reduced by 0.2% exp. With 5 or more people, you do not suffer any exp penalty. If you do not have enough exp to cast this skill, it will fail. Quest: Talk to the NPC in the Prontera cathedral "Nun Rainars". You need to bring 30 holy water and 20 blue gemstones to her (its recommended that you bring 10 extra though). After bringing her the required items, she will attempt to teach you redemptio. The chance of this succeeding is random, and each attempt uses 1 holy water and 1 blue gemstone. Once you succeed, you'll have learned the redemptio skill. Description: Shrink has a chance to knock back opponents when you successfully block an attack with Autoguard. Shrink lasts for 5 minutes, and you can deactivate the skill at any time by using it again. The success rate to blocking an attack depends on the level of autoguard you have, and only works when you have a shield equipped. Cast Time: No cast time. Description: Creates an elemental converter. You can create an elemental converter of any of the 4 elements, fire, earth, wind, and water. These converters can be used with the skill Elemental Change or used on thier own to endow yourself with an element for a short period or time. The chance of success is based on your level of that elemental endow, as well as your Dex, Int, and Job level. Note: With medium to high int/dex and high level endow, you should have close to 100% success. Quest: At 1 o'clock direction in Juno, in the Sage Acadamy, there should be an NPC near the entrance to talk to. He will require you to bring items to him. To learn elemental change, you will need to bring 7 Scorpion Tails, 12 Rainbow Shells, 10 Horns, 10 Snail Shells, and 4 Blank Scrolls (purchased for 4000z). Once you have the required items, he will teach the skill to you. Cast Time: 2 second cast time, 1 second delay. Description: Permenantly changes the element of the target monster. Of the 4 elements fire, water, earth, and wind, your sage may only learn to change to one of of them. When the skill is cast, it will use one Elemental Converter of the element you've chosen. This skill does not affect boss monsters or players. The items required to learn elemental change depend on which element you elect to take. Depending on which you chose, you will be required to gather 20 stones of that element. Earth Elemental Change: 20 Yellow Lives. Wind Elemental Change: 20 Wind of Venture. Fire Elemental Change: 20 Red Blood. In addition to the stones, you will also need one Morroc Solution and one Payon Solution. Once you have the required items, you will be taught the Elemental Change skill corresponding to the element you picked. Description: Transfers a single one of your existing spirit spheres to a party member. The party member cannot have more than 5 spheres at a time, and if you do not have any spheres yourself, the skill will fail. Quest: Enter the building at the center of the Monk Monestary, and greet the elderly man there. Next, a 3 o'clock from here you should see an NPC "Training Monk". If you talk to him with 0 weight, he will teach you the skill Ki Transfer. Cast Time: No cast time. 2 second aftercast delay. Description: Hits an opponent with a focused blast of energy, which stuns nearby foes and causes them to recoil. The target of this attack takes 300% damage. Any enemies adjascent to the target get knocked back 5 cells and have a 70% chance to stun for 2 seconds. The target itself does not get knocked back or stunned. This skill is usable in pvp and woe, but targets will not be knocked back on maps which knockback is not permitted. Quest: Head to the old man in the center building of the Monk Monestary. He requires two things before he will teach you Ki Explosion. First, you must learn Ki Transfer, and second, you must gather natural objects dropped by mandragora's. Return to the man with 20 stems and 3 shoot, and he will then teach you Ki Explosion. Cast Time: No cast time or delay. Description: Close Confine locks you and your opponent togeather, making it so neither of you can move. Durring this time, you will gain a bonus +10 to your flee rate. The skill can be cast on any target within 2 cells of you, and locks you togeather for 15 seconds. Until the skill wears off, the only way for the lock to be broken is for one of the two characters to die, teleport, be knocked out of range, or become hidden. Close Confine can be used in a PvP and WoE setting. The skill does not affect boss type monsters. Quest: On the Faros lighthouse map located at one o'clock, enter the building "Helmanson Jr.'s House". Inside there will be an NPC near the landlord named "Tolgrek", and when you talk to him he will tell you about his troubled father, who's in a secret room in the rogue guild. At the Rogue Guild, talk to the job change npc Maki. Ask him about the secret passage, and then go to the room to his left and in the top left you should find an entrance. In the room straight ahead, talk to Tokgrek's father Hizrakrek. He will ask you a series of questions, and if you ask incorrectly he will kill you instantly. When you correctly answer his questions, he will ask you to talk to his other son, Legrek. In the map east of the lighthouse at 5 o'clock you should find a building "Holgren Jr.'s House". After talking to Legrek inside, report back to Tolgrek. He will send you to Zeigrek. Zeigrek is located in Anthony Jr's House, on the map north west of the lighthouse. Talk to Zeigrek, and then return to Tolgrek's father. Afterwards return to Tolgrek and he will ask you some questions. Once you get them right, he will ask you again to return to his father. When you talk to Tolgrek's father this time, an NPC resembling a Geffen Guard will appear and question you. Once you clear this, you will be taught the skill Close Confine. Description: For two minutes, a wizard can use Sight Blaster to protect himself using the fires of Sight. While Sight Blaster is active, any enemy that steps in a 3x3 area around you will be thrown away and take a 100% matk fire hit. In war of emperium, there is no knockback. Once the skill has hit a target, Sight Blaster ends. Quest: On the very top floor of the geffen tower, there will be a Cat you need to talk to. He will send you to the Prontera Knight Guild. In the Knight Guild, located north west of prontera, you'll need to introduce yourself to an NPC Simon Meyas. Afterwards, you'll need to return to the highest floor of the Geffen Tower again, with specific items. Bring the cat 10 Crystal Blue, 10 Yellow Live, 10 Red Blood, and 10 Wind of Venture and he will teach you Sight Blaster. Description: Phantasmic arrow creates a spiritual arrow of illusion, which can be used to fire at an opponent. This skill does not take an arrow as one is created for the skill. When it hits a target, it always does ghost/spiritual element damage. Quest: In the north end of the Archer Village, you need to talk to two NPC's Albest and Raiden Karus. They will request the following items: 5 Cursed Ruby, 5 Harpy Feathers, 30 Pet Food. Bring them these items, and they will teach you Phantasmic Arrow. Quest: North of Prontera, just east of the castle entrance, you'll see a Timid Young Man. When you walk near him, he'll do an emotion. Talk to him. Durring the dialog, chose the second, and then first options. In the very north west section of Morroc, near the access to the piramid, there'll be a bar. Buy a Tropical Sograt from the bartender, and return it to the Young Man in Prontera. Once you're done this, return to the Bar in Morroc. You'll see Riott, a Spiteful-Looking Bard. Talk to Riott. At this point, if you have not completed the wandering bard quest, you will have to do this now. Riott will send you to the bard Errende in Geffen, who you can find just east of the fountain. You will have to complete Errende's quest before you can continue. If you have done the Wandering Bard Quest, then Riott will send you to Niflheim to gather 5 Islis Eggs. In Niflheim, the Islis Chicken will appear in one of several random locations. When you go near the Chicken, you will have a chance to obtain an Egg before it runs away. You'll have to track it down until you have 5 Eggs. Likely locations for the Chicken can be seen here. The actual locations for the chicken cycles in order, and the actual locations are : (239, 68), (186, 204), (83, 204), (147,81), (211, 143) (Thanks Soras for the info). Return to Riott in the Morroc bar and he will teach you the skill Pang Voice. Description: Do a wink to a specific target, charming them for 10 seconds. If used on a monster, they become non-agressive for the durration, and has a success rate of 70%. The skill will fail on high level monsters and boss monsters. If used on a player, it will have a low chance to cause Confuse status ailment. Wink of Charm only works on demon, angel, and demi-human type monsters. Quest: Near the center of comodo town (204, 172) you'll find a lady 'Sanel' that you need to talk to. You will need to have a crystal mirror with you. 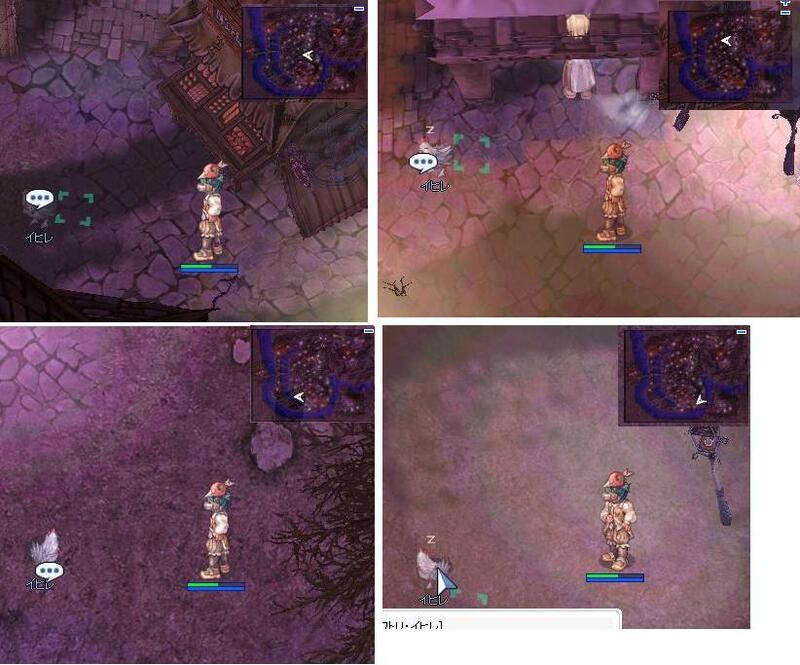 In north prontera city (183, 333), you'll need to find and talk to the NPC Aeru. She will send you somewhere in town (where, seems to be random), and you will need the following items when you return: 1 Alcohol, 1 White Plate, 1 Apple, 3 Banana, 5 Well Baked Cookies. Return to Sanel in Comodo, and she will teach you Charming Wink.